Other than watching my 4-year-old have a ball in the NFL Experience, my two favorite parts of Super Bowl week in Central Indiana so far had to be: Seeing the Super Cars lined up together on Meridian Street and being a part of the first-ever Media Day that was open to the public. 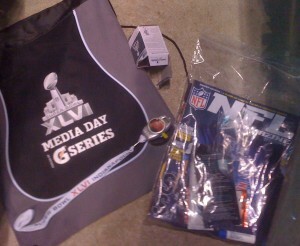 So, I will touch on both as I put together today’s installment of All Access Hendricks County’s countdown to Super Bowl XLVI. This discussion also couldn’t be timelier as our Super Cars officially go on display at 10 a.m. today at Hendricks County’s Super Celebration Site, the Metropolis Shopping Center in Plainfield, Ind. 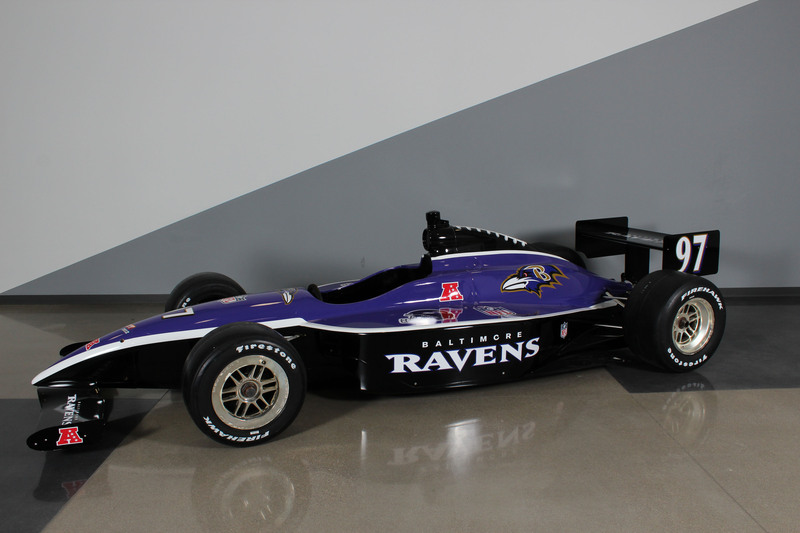 Our Super Celebration Site received the Baltimore Ravens car, which is on display in our Metropolis Welcome Center near the Kirkland’s store. We also have two NHRA Funny Cars on display beginning today from Don Schumacher Racing and John Force Racing in the Event Center on the second floor of the mall above Journeys. So make sure to check them out as well as the arcade games and other fun activities there through Saturday. For more information, visit our website. My visit to Downtown on Friday, the first day of fan festivities, started on Meridian Street. 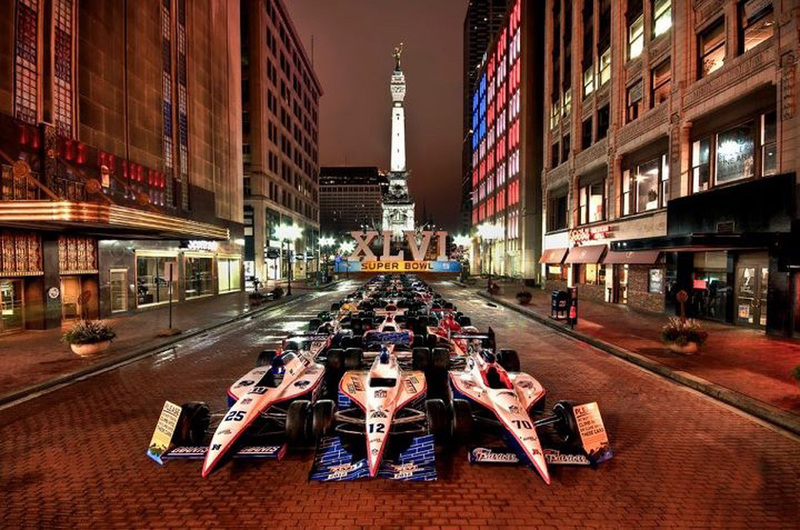 I couldn’t wait to see all the Super Cars, representing every NFL team, lined up in front of Monument Circle and the large Roman numerals. As soon as turned the corner at Washington and Meridian streets, I couldn’t believe my eyes. For anyone who got to see it last weekend before the cars were dispersed to various locations statewide, it was quite a sight to behold! Merging Indianapolis’ most notable event, the Indianapolis 500, with the NFL was in a word, genius. 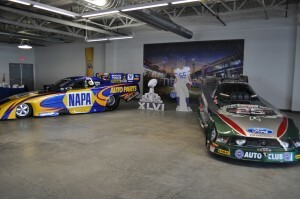 I heard from quite a few visitors who said the one memory they will take away from Indianapolis hosting the Super Bowl will be those Super Cars. Then on Tuesday, I couldn’t wait to see what the NFL had in store for the fans as they opened up Media Day to the public for the first time. The anticipation outside was palpable. Being a first-of-its-kind event, no one really knew what to expect. “As soon as the Patriots won the AFC Championship game, I bought a ticket to this because I figured this was close as I was going to get to the big game,” Tina McGinn, a Fishers resident who was formerly from Massachusetts told me as we waited outside the stadium. As we entered the building, we were handed a canvas drawstring bag with plenty of goodies inside including a small radio on a lanyard. The radio allowed each Media Day participant to flip through six different channels, to listen to various player interviews and the NFL Network coverage. I personally couldn’t wait to see how they changed the inside of the stadium for the Super Bowl. Gone were most of the references to the Colts as they were covered by temporary yellow and orange Super Bowl signage. It also hit me as I scanned the stadium that in just a few short days the Super Bowl would be here, and the seat assigned to me on this day would literally cost thousands of dollars on Sunday. As Media Day got underway, the New England Patriots came out first. 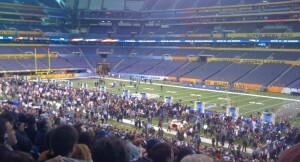 Fourteen podiums were set up on one side of the field for the top players and Coach Bill Belichick. I knew it would be a circus down there with media representatives from all over the globe, and they didn’t disappoint. I saw a guy dressed like a super hero and another dressed like a 1920s football player complete with a leather helmet. As I tuned in to listen, some of the questions posed to the players were odd including one guy who asked each player if they would have the power of the divine beast on Sunday. Yeah, the players were as confused as the rest of us. I heard wide receiver Wes Welker call Belichick a “bad dresser” and Tom Brady say he would like nothing more than to see Peyton Manning back out on the field next year in a Colts uniform, which solicited a roar from the fans in attendance. 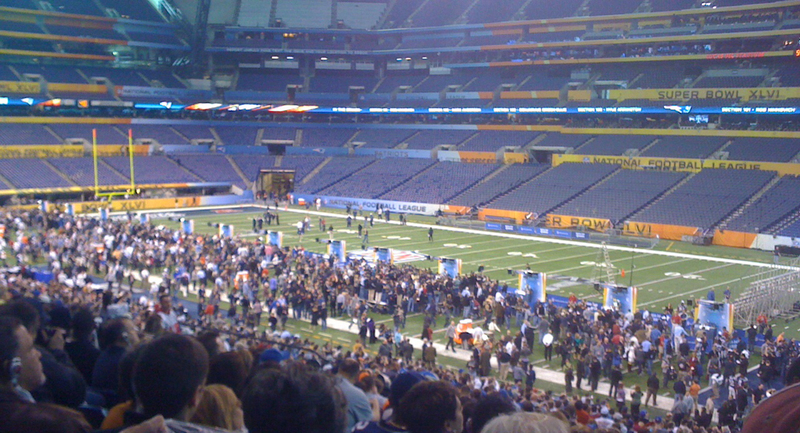 The New England players talked with the media for an hour, and after an intermission, the New York Giants players came out for their hour-long interviews. Eli Manning got to talk ad nauseam about his older brother, and wide receiver Victor Cruz spent a majority of his time answering questions in Spanish. It really was a spectacle in the truest sense of the word, and as a fan I loved it. There is no doubt in my mind Media Day will not only continue to be a public event in future years, but will likely become a bigger part of the Super Bowl and a fan favorite. 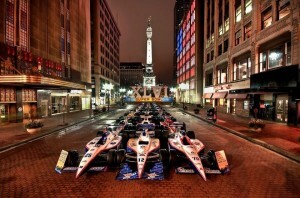 It was just awesome that Indianapolis got the first crack at it, and I got to be a part of history.